We contract to both public and private clients for ‘tyre fly tip’ clearances, tyre dumps or tyre remediation contracts throughout the UK. These tips occur as a result of ‘fly tipping’, arson attacks - or from failed tyre reprocessing businesses. 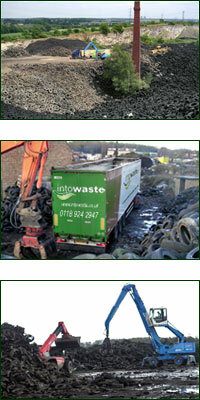 Intowaste has experience in over 20,000 tonnes of tyre clearance work. 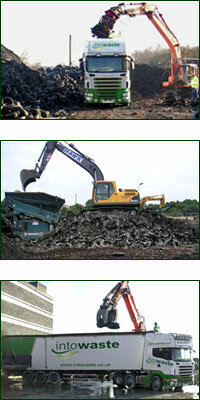 This includes the clearance of some of the largest tyre dumps in the UK. We endeavour to concurrently re-process tyres into tyre derived products (either on site or off site). - This can include mobile reprocessing tyres to a tyre chip or shred (with our own unique mobile tyre shredder), or producing tyre bales (blocks) for engineering applications. Our turnkey contracting service includes survey, project planning, loading and the complaint disposal of mixed and/or part processed tyres in these tyre tip sites. We work closely with our clients in the pre-planning and project delivery stage, to maintain financial control and a disposal programme of tyres to match on or off site reprocessing capability. We utilise national strategic relationships with all tyre re-processors to dispose of the tyres in the most cost effective manner, while minimising road transport and its environmental impact.